The Amenity Hut is really nice. It’s a 6′ x 12′ little structure with an enclosure for our composting toilet and for a shower. We mounted a sink on the outside wall. We have running water from the lake provided by a solar-powered pump and pressure tank. 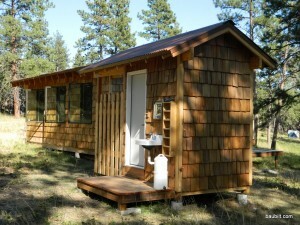 Amenity Hut from back side showing outdoor sink.